Last week, the German city of Bremen hosted this year’s Protestant Church Festival– ‘Kirchentag’. This is an important biannual event not just for Protestants, but for everyone. A glance at the list of prominent visitors underscores its significance: Chancellor Angela Merkel, Foreign Minister Frank-Walter Steinmeier, President Horst Köhler and Nobel Peace Prize winner Martti Ahtisaari were among the more than 100,000 visitors – as was ONE! A ONE team informed Kirchentag visitors about the current challenges in developing countries. We handed out postcards and whitebands and asked participants to support the Article ONE with their signature. The Article ONE calls on the future German government (elections will be held in September) to keep their internationally given commitments to help end extreme poverty. 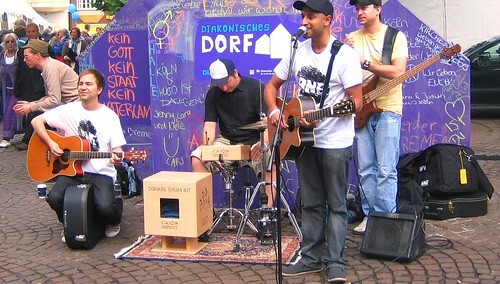 We were supported by ONE member Ro’Shan and his band who improvised a gig in the street and in between their songs asked listeners to sign the Article ONE. Thanks to the attention raised by the band’s fantastic music, we were able to collect many sign ups and have many interesting discussions on development with the audience.